Wednesday saw me realise that the need to drop the car off at the garage meant that the window for a run was short, so it was just a brisk 3.5km across the village and back rather than the intended 5 or 6km tempo run. Friday by contrast was planned to be short. Inspired by the Strava Mile sweepstakes, I decided to run a brisk mile – something I’ve never aimed at before. Although I’ve done intervals with fast runs, they’ve been embedded within a larger effort and so I’ve never focussed on them individually. I did a warm-up run of 2km fairly gently (though 12 months ago it would have been at my limits), then paused to get my breath while leaving my heart and muscles nicely warmed up, then ran back. I was somewhat frightened by the 4:10/km pace initially, and couldn’t quite keep that up, but knowing that I needed to beat about 4:33/km, I kept ahead of that and set a new kilometre PB of 4:23 and mile PB of 7:05. Very satisfactory. The picture is at Languard Point, with the sea behind me, the exit of Harwich Harbour to the left, and shows a bit of the nature reserve, cluttered with the accumulated remains of several centuries of military defences and hemmed in by the Port of Felixstowe behind and the seaside world of leisure away to the right. The boardwalk is really bouncy to run on – great fun. A lovely spot. My longer Sunday runs have been around the lanes near home for quite a few weeks, and while each has been somewhere different and included new roads, there has been a certain sameness about them, and it was time to shake things up a bit. So this morning it was ho! to Felixstowe for a visit to the seaside – not entirely novel as I’ve run here a few times before, but not for a while. 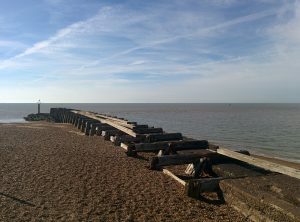 I ran south-west to the tip of Landguard Point, then retraced my steps and continued north-east to the first Martello Tower then along the prom, past the pier for a while before turning to run back to the car. By the time I finished just after 9am it was 23° and there were already sunbathers out, with lots of other people taking a stroll on the prom, together with a few other runners. There were the smells of rubber from things being inflated, of cooking food, and of chlorine from the leisure centre. The last is a bit of an obstacle at the moment as the prom has been closed since last June for a short distance to allow some works to be carried out, which means a little diversion around the leisure centre, a route that has confused my Garmin each time I’ve done it. The intention was for a run of 8km at 5:37/km but my legs felt great after a gentle week and I committed one of the sins of the taper period and ran both further and faster, but not too seriously so. I will need to be very careful to rest properly towards the end of this coming week, but no harm done today. It did at least have the benefit of giving me fresh confidence as there was so much in the tank to push a little harder and plenty of energy when I finished. It has left me in fresh doubt though about whether to adopt the run-walk strategy that I used successfully on my 10-mile race at the Lee Valley Velopark (and last Sunday’s 15.3km) or to return to my more normal “run it all” approach and trust to the energy gained from the taper and the occasion to see me through. Something to ponder. 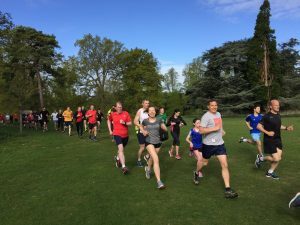 This is me (in red, centre photo) enjoying Bury St Edmunds parkrun back in April, and at the time of writing still the banner photo for the event on Facebook. I’ve now done 72 parkruns. 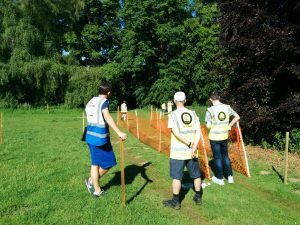 Volunteering is exactly that – voluntary – but nevertheless it is a truism that parkrun wouldn’t exist without volunteers, and having volunteered just once, it was about time I improved my volunteering ratio. I’m currently running a little less as I prepare for next weekend’s race, so an email plea for volunteers on Thursday saw me offer my services straight away – I’d volunteered for next week some weeks ago, so it’ll be two in a row. Last time I was “backup timer”, and this week I was a “scanner”, in a team of three scanning each runner’s personal barcode and their finish token, information which then gets combined in a computer with the information from the timers to assign a time to each person. Having been asked to arrive half an hour early, I wandered around 25 minutes before the off, and there was no-one about, but a few minutes later the action started and the various volunteers got briefed on our roles. I stood in front of the start line (off to one side) for a view that is quite different from being in the pack, and watched the stream of humanity go past at just a few seconds after nine o’clock. Then it was a casual walk over to the tent where the scanning takes place, and a wait, first for the runners to start their second lap, and then for the first finisher. It’s a gentle start, and then the pace gradually hots up as we get towards the middle of the pack where most people finish, and the queue for scanning lengthens. There was much scope for more efficiency as people at the front of the queue weren’t paying attention, and many of them presented their finish token first, or barcodes facing the ground. It was enjoyable working my way through them: I was surprised at how many have their barcodes on a rubber bracelet, though they scanned surprisingly well (with the exception of one or two pink ones). Soon the queue had been whittled away, and it was a friendly wait for the last few to cross the line. Then packing up, putting away the tent, and carrying stuff back to the cars. An enjoyable morning, perhaps partly for the novelty, but it’s good to be able to help out. Next week timing again. As my main road shoes (I have another pair of trail shoes) are coming towards the end of their recommended life, I treated myself to a new pair of Brooks Adrenaline GTS shoes, my fourth such – this is the 2017 model, and I’ve had two 2016s and a 2014 pair. The primary focus was to be able to run the London 10-mile a week on Sunday in shoes giving their best. Despite the fact that they shouldn’t need “running in” and are essentially the same as three previous pairs, I thought I’d better give them a little test. So this morning it was my semi-regular 6.4km loop to Drinkstone and back. Once warmed up, my legs felt good – whether it was a fairly restful few days (ignoring the 15km on Sunday) or the new shoes (physically or psychologically) I don’t know. I’ve also managed to shed a small amount of weigh in the last couple of weeks (Christmas weight, here I come!) which will have helped a tiny bit. But anyway, the net result of all that, despite deliberately slowing down for a km in the middle, was a new record pace on this route and for a couple of segments within it, and a 6km personal best time of precisely 30 minutes. So the shoes passed the test with flying colours, and are now put aside for 10 days until it’s time for Richmond Park. With two weeks to go before the London 10 mile race in Richmond Park, Sunday was my last long run for the next 14 days. My schedule called for 15.3km at 5:37/km and I managed 15.3km at 5:36/km, coming in 9 seconds ahead of plan, so that was pretty pleasing. Today was a day of experiments, not so much with the London 10 mile in mind, but thinking more of the London Marathon and training for it. So it was my first outing for my new Camelbak hydration vest which allows me to carry 1½ litres of water on my back and drink on the move. The Camelbak also has some small pockets on the front into which I put a couple of Sport in Science gels and energy bars, which I consumed on the run. The Camelbak worked well. I was unsure how quickly I was depleting the water supply (one can obviously tell when holding a bottle of water, but tucked away on my back, it was less clear) – hopefully I’ll get better at judging that with experience. The tube gently rubbed my neck as it passed from my back to my front, more annoying than causing any physical problems. Later inspection showed that it had arrived with the tube emerging from the left at the back and moving to the right at the front, which I fixed for next time. The gel was a novel experience, the most difficult bit being tearing it open with sweaty fingers – more experimentation needed, I think. The energy bar was more of a challenge to eat on the run, and presumably slower to be absorbed, but did provide variety to the gel. Plenty of time to experiment on my long runs over the next few months. I’ve said here and elsewhere that I’m using travel with work as an opportunity for my running, not an excuse. But that doesn’t mean it is without challenges. Some can be tackled with planning: when I need to stay away, but it doesn’t matter where exactly, then I try to pick somewhere where it will be practical to go for a run on arrival in the evening or first thing in the morning. But sometimes where I’m staying just doesn’t lend itself to running, or I may have colleagues with me making adjusting plans more difficult, or hire cars to drop off, or aeroplanes to catch, or simply no sensible way to bend my day to fit in a run. There is always scope to get up from a hotel bed earlier, or get home later by stopping off en route. But tiredness is a problem not so easily addressed. Yesterday I got up at stupid-o’clock to drive to Liverpool to fly to Northern Ireland, and this morning, after a long day, it was an early departure to come back. I’ve yet to have a run in Northern Ireland, but it was impractical to do so this time, so I stopped off in Warrington for a run on the banks of the St Helens Canal, also known as the Sankey Brook Navigation. My run schedule called for some six-minute fast intervals with three-minute recovery. But my body quickly told me that after early mornings, travel, and not to mention a weekend of fell-walking, it had other thoughts about running fast for six minutes. So I improvised, and if I want to be positive, what emerged was 6km of fartlek. It was hard work, whatever it was. A run schedule is all very well, and making a gap in the calendar is important, but making sure the body is ready too, that’s a different challenge. Encouragement and magic gingerbread from friends helped me find the energy to get out of bed in good time rather than lie there listening to the rain. I headed down the M6 with the wipers on storm, wondering if it was a good idea, but by the time I reached Preston the rain had stopped and I discovered a delightful town centre park alongside the River Ribble and with a lovely Japanese garden. I also found almost 400 people celebrating Preston parkrun’s 5th birthday, a number of whom were very welcoming to a stranger from distant lands. I don’t know what amp/speaker system the run briefer had, but any similar group thinking of getting one should get the same – amazingly effective. It was, however, somewhat difficult to concentrate on the verbal instructions and commentary, because standing next to the adult briefer was a young girl who gave a visual interpretation with gestures for everything he said and exaggerations of all his own gestures – it was wonderful and really made my day. The line-up for the start was friendly but very crowded: I’ve never had so many beautiful women touching me at once. Sadly that didn’t last long and we were off along the bank of the Ribble, and then to the hill which the run briefer had described as steeper and longer than it looks, and he was right, and he hadn’t mentioned the slippery surface. Not a big hill but it punched well above its weight. The rest was very pleasant around the park and under four bridges. And then two more laps: a very enjoyable run, even if some way off my fastest after a tiring week. Not surprisingly I was overtaken by The Flash, but managed to stay ahead of Jabba and Princess Leia, among others who were celebrating the birthday run in fancy dress. At the finish, there was an embarras du choix of 5th birthday cakes, all being very ably supervised by the girl who’d entertained me at the run briefing, and I made a point of thanking her for that as well as the cakes: hopefully I improved her day even if not as much as she improved mine. So, after thanking the run director and spending a few minutes cheering in other runners, it was back to my temporary home for the weekend, inspecting the gradually rising cloudbase and to plan a modest fell walk for the afternoon. Having said the other day that I had determined to use work travel as an opportunity rather than an excuse, I stayed in bed in Elgin yesterday (after all, it was a great bedroom with a four-poster bed and three showers to choose from!) so on the last morning of the Scotland trip I felt I really ought to get out. So despite a latish night in the bar last night, I set the alarm for 6am and got up and out into a bright morning, running through the streets of Bridge of Allan and out to the north bank of the River Forth. The footpath along the bank of the Forth offered views of the Wallace Monument and of Stirling Castle. It was a bit of a challenge to get myself out of bed but as so often, once I was outside and running, I was so glad I had done so. Why that lesson is so easy to relate, but after all these years still so difficult to put into practice is a challenging question to answer. A good cooked breakfast and then the flight from Edinburgh to Birmingham and a drive back to Cumbria for the weekend – I’m not sure whether there will be any weekend running: we will see. Travelling with work used to represent a challenge to my running – or perhaps “excuse” was a better word. I find travel tiring, and fitting in the running meant rising early before hitting the road, or finding the energy to go for a run after getting back after hours of driving, or getting up from a hotel bed when I really wanted to enjoy the luxury before knuckling down to work again. But a couple of years ago I vowed to use the travel as an opportunity, not an excuse. It’s an opportunity to run in new places (or at least places where I run infrequently), even if it means a very early rise from a hotel bed, or stopping off part-way home to run. Last night I flew up to Aberdeen and stayed at an airport hotel prior to driving to Elgin this morning. For once there was little hurry so there was plenty of time for an extended run around Dyce (the small town where the airport is located). With advice from a runner on the WeightLossResources website, I set off in perfect running weather. I ran around the end of the runway, through housing into woodland where there were bluebells aplenty, down through the woods to the River Don where I diverted to the south to the weir, then back north along the bank of the Don for a few kilometres before joining the path along the old railway line to the railway station, over the bridge and then back along the airport perimeter to the hotel. My legs felt a little tired after Sunday’s half-marathon, but I slowed down a little and they were fine. The sore spots on my back (from sweaty shorts) gave me no difficulties. So all in all, a very satisfactory and enjoyable run. Back at the hotel I opened the laptop and ordered some sports gels and energy bars and recovery stuff, to start my experimentation with better long run fuelling. A record total number of 386,050 applicants registered for a ballot place in the 2018 Virgin Money London Marathon. This is the highest number of applicants for any marathon in the world. 327,516 of those applicants were from the UK. This is 73,586 up from the previous UK applicant record of 253,930 for the 2017 event – an increase of nearly 29 per cent. Just over 58% of the UK applications for 2018 were from people who have never run a marathon. I feel even more privileged to have gained a charity place. Wouldn’t it be ironic if I got a ballot place too? With about 16000 places available, the odds of success are about 1 in 24, or 4%. With the excitement of Friday’s news of the 2018 London Marathon place still simmering away (indeed, perhaps on a more active boil), and with the previous weekend’s 10-mile PB at the Lee Valley Velopark also not gone away, I perhaps got a bit carried away with this morning’s run. When a route from Norton through Pakenham and Stowlangtoft was first considered, it was about 15km, but in planning last night, I looked at an extension to the north to make it up to half-marathon distance. I set off knowing that I could have the choice, but really wanting to do the HM distance. Added to that danger was that I had to make the choice around 8km, at which point I was still feeling fresh. I turned left rather than going straight on, committing myself to the longer distance. This did give me the opportunity to discover the hamlet of Langham which I’d never visited before, but as I approached 16km I started to struggle, and by 17.5km was finding it very hard indeed, and there was a fair bit of walking towards the end. I did find the strength to turn off my shortest route to visit another map square, and then to run past the car for another 300 metres to get to the full 21.1km. It was really too big an increase in distance for me to expect to be comfortable, and then I tried to do it too fast in the circumstances, but nevertheless it was a good feeling to have succeeded. I was passed by 12 cars and a motorbike, and passed a deer, a pheasant, two rabbits, three dog-walkers (with seven dogs), and two dog-free walkers. I need to find a way to take on board water and potentially fuel during long runs. I’m going to look at running backpacks with hydration pouches, but do I still then need a belt for easy access to other items while running? From Christmas onwards I will be doing a run of 13 miles or more almost every week as I head towards VMLM on 22 April. What was the pinnacle of my running distance-wise, and is still the longest I’ve ever run, will need to become routine. With the exception of those sore spots on my back, post-run impact was pretty modest. This is good, and is encouraging me to consider more long runs this year before I get to the more intense 16-week lead-in to the VMLM. I mustn’t get carried away too quickly. My body is still better geared to shorter running at the moment. My training focus should be the London 10-mile in Richmond Park in June. I started running indoors in late 2007, and after reaching 5km indoors in March 2008, started outdoor running, and entered the first Royal Parks Half Marathon in October 2008. I did two more half-marathons in Reading in 2009 and 2010, after which my running rather lost objective and focus. In 2014, I discovered parkrun, which gave a fresh objective, and I rediscovered my enthusiasm for running. Successful weight loss in 2016, together with several running friends (mostly online so far) and a growing love of parkrun tourism further increased my love of running. A chance visit to the London Marathon in April 2017 (in the interval of Harry Potter and Cursed Child) generated a lot of emotion, and I found myself, having vowed not even to do another half-marathon because of the strain the training had put me under, seeking a place for the 2018 London Marathon. To my delight and surprise, I quickly gained a place running in aid of Guide Dogs. With almost 12 months to go, my enthusiasm for longer distance running started to bubble over, and I thought it might be a good time to experiment with a blog, mixing run reports, thoughts and plans. I don’t expect a wide audience, but it may be interesting to experiment with the format.